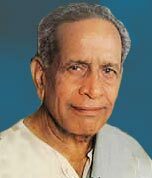 Pandit Bhimsen Joshi, who holds a legendary status in Indian Classical music was born in Gadag (Karnataka) on 14 February 1922. His unique style and mastery over ragas has made him un parallel to any other vocalist in the country. A conservative schoolmaster's son, Bhimsen Joshi had a passion for music even from his early childhood. The little boy deeply moved by a recording of Abdul Karim Khan, the founder father of the ' Kirana gharana', was later destined to become an accomplished jewel of the gharana. He left home in 1932 and was on the move for the next two years in search of a guru. He travelled to Bijapur, Pune, Gwalior where he tutored under Ustad Hafiz Ali Khan, the well-known sarodiya and father of Ustad Amjad Ali Khan, then to Calcutta, Punjab and back home, only to goad his father into sending him to Sawai Gandharva for training. In 1936, Joshi started his rigorous training under Sawai Gandharva (Pandit Rambhan Kundgolkar), the eminent Khyal singer student of Abdul Karim Khan at Kundgol, near Gadag. He taught him the basics of Khayal singing. The tutoring spanning several years honed his inborn talent and helped him attain his mastery over ragas. Bhimsen Joshi sings in the khayal style and has also rendered heavenly thumris and bhajans. Some of his popular numbers are 'Piya milan ki aas', 'Jo bhaje hari ko sada', 'Mile sur mera tumhara' etc. He has improvised and combined ragas to form new ragas like the Kalashri (Kalavati and Rageshri) and LalitBhatiyar (Lalit and Bhatiyar ragas) and has also developed and excelled in an unique style of singing adapting characteristics from other gharanas. Be it a new raga or a bhajan, khyal or kirti he performs with absolute ease moving from one pitch to another in the same breath effortlessly. His first public concert, to mark the shashtyabdipoorti (60th birthday) of his guru Sawai Gandharva, was held in Pune in January 1946. By the early 50's his voice became known throughout the country and then he began to travel extensively in India and abroad giving concerts. This musical marvel is the recipient of prestigious awards like the Padma Shri from the Indian government, Sangeet Natak Academy Award, the Mysore Sangeet Natak Academy Award etc. Every year he has been conducting a music festival at Pune with performances of famous classical musicians, to observe his Gurus death anniversary. He married twice, the second time to Valsalabai his own disciple who played a big role in his success. Apart from singing his other passion was automobiles, where he had a definite flair for fixing engines. Pundit who had been riding the crest of popularity for the last several decades had announced his retirement plan in a concert. He passed away on 24th January 2011 at the age of 88 after a month long ailment in a Pune hospital. Connoisseurs of classical music the world over are going to miss the divine musical experience of hearing this master sing.